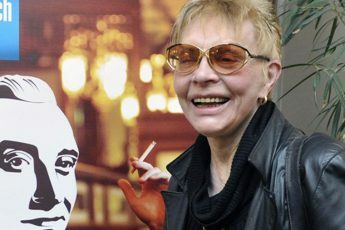 A couple of weeks ago, the movie theater MK2 Quaie de Saine in Paris decided to redistribute five short films by Czech filmmaker Hermína Týrlová. Týrlová is considered one of the founders of Czech animation films. She was born in 1900 and made her first film, Zamilovaný vodník (The Waterman in Love) in 1928, and her first animation, Ferda Mravenec (Ferdinand the Ant) in 1943 soon after she was offered to work at the Studios in Zlín, two years before Karel Zeman would join her. Zeman, is considered one of the pioneers of Czech animations, and he is well known for his films based on stories by Jules Verne. In 1947 Týrlová and Zeman created the film Vánoční sen (The Christmas Dream) together. In style and narrative, the film can be seen as an early prototype for the rest of her oeuvre. The Christmas Dream is about a little girl who is given new toys for Christmas. Excited by the presents, she casts off her old favorite doll. But during her sleep, a weird Christmas dream haunts her in which her old doll tries to win its place back into her heart. The doll comes alive and reminds her of all the beautiful things it can do, before demonstrating to her that it can also have fun with the new dolls. Not before long, bad conscience kicks in and a storm transforms the room into a disaster. One expects the little girl to pick up her doll first thing on the next morning. Seeing the film today, it seems like a witty commentary on modern consumer society, much in a similar way as Pixar’s Toy Story 1. In this film, the main character Andy, also puts his old toys aside when he gets a more fancy toy for his birthday. In both films, the toys try to win their owner back, in a protest against the shortlived interest we attribute to relationships and to things in general. The film is set at the dawn of the throw-away-society. In most of the films of this period, Týrlová makes puppets interact with real life actors. Perhaps the most remarkable example for this is her 1946 Vzpoura Hracek (The Revolt of the Toys). The film includes two real actors, a toy maker and a Nazi soldier. The film sets out with the toy maker finishing off a wooden Hitler miniature. Outside the toy store, a Nazi soldier walks by and sees the shadow of the Hitler figure behind the curtain. Recognizing the Nazi salute, he then breaks into the toy store to arrest the toy maker who in the meanwhile escapes out the window. Frustrated, the soldier takes his anger out on the toys by kicking and destroying them. But the toys to revolt and finally chase him out with fire and bombs that, although only playthings, resemble the the end-of-the-war pictures that circulated only two years prior. The Revolt of the Toys is perhaps the most political animation film of Hermína Týrlová as most of her films are based on classical value-based storytelling for children. But The Revolt of the Toys uses real political events to create a historical narrative. At first sight the story appears to be wishful thinking. All the toys unite to fight against the evil Nazi. This, of course, is very close to the version of events the communists propagated after the second world war. 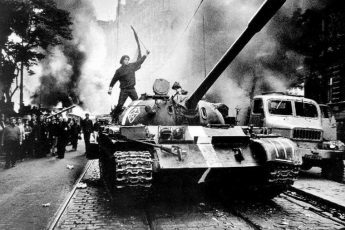 The red army and the resisting communists all worked together to throw down the fascist occupation. But Týrlová makes a more ambiguous statement. The person building Hitler also builds the toys fighting against Hitler’s evil supporters. The film thus predicts a major part of the problems of coming to terms with one’s past that the Czech’s were unable to face for the coming decades. In short, it hints at the Czech’s own contribution to the Nazi power. The five animations that were recently shown in Paris are less political. They were made in the early 1970s. They are also different in style. 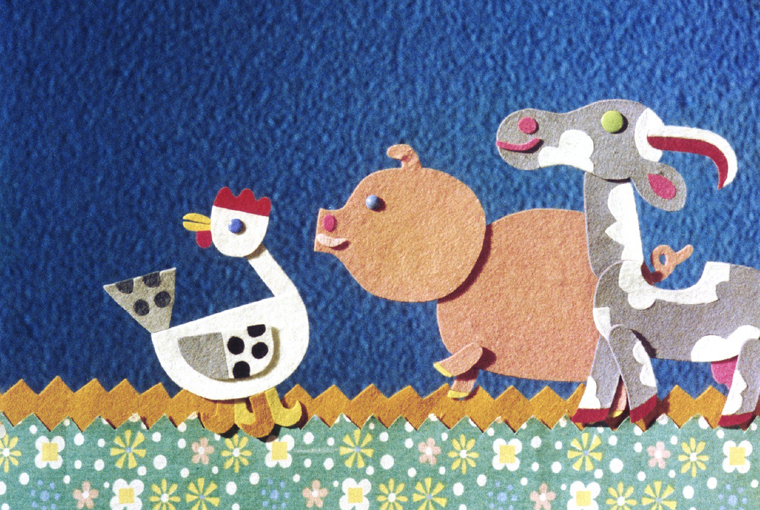 Les contes de la ferme are cutout animations of about 10 minutes length each. Most of them begin and end in front of the doghouse, where the dog of the farm enjoys a lonely life. But other animals, like the cows, the pigs and the ducks also appear recurrently. The narrative usually reveals a moral based on communal good. In Obavana kacena (Drôle du Canard) a family of ducks steals apples from a hedgehog, but when one of the little ducklings is attacked by a serpent and the hedgehog saves it, they find an apple tree returning to the hedgehog the stolen property. A similar message is at the heart of Un Noël à la ferme, where the dog tries to keep wild animals from stealing food from the farm until he is trapped in a snow hole and freed by the same animals he chased away before. He then decides to collect food for the rabbit, the deer, and the birds showing his gratitude and taking back his initial intention. While the message of these films is mainly educational – don’t take from others, and if you’re nice to the one’s that harm you, they’ll be nice to you – the animal’s relationship with human’s is less harmonious. In Toulave telatko (La ferme en fête), two cows want to have a party but the little calf is attacked by a boy with a bow and arrow. In Pejskuv sen (Le chien rêveur), the dog ends up attached to a chain after escaping from the farm for a flirt in the neighborhood. In another two films, Jak pejsek vycmuchal darebaka, and Oslik Usatec that were not part of the films chosen for Les comtes de la ferme, the same boy chases all of the animals and destroys parts of the farm in the first film and in the second the farm’s donkey is abused for rodeo by the boy, who is now wearing a cowboy dress. But in all occurrences where the animals are treated badly by humans, they unite to fight the mean boy, and to destroy the chains of the dog, to free the donkey and take revenge. While one could find a message parallel to The Revolt of the Toys – animals are strong together – humans seem to differ from animals in Týrlová account, in that they lack the understanding of their wrongdoings. The lesson the animals learned from their misbehavior was given to them through the form of a better example. Learning was a way for them to unite. Týrlová’s humans, and especially the boy, lack this quality. The boy doesn’t learn. On the contrary, he seems to corrupt the peace and the unity on the farm. There could be many explanations for this. One may find a larger parallel between the corrupted boy and the political system of Týrlová’s time, with the boy destroying the communal ideals of the farm. What only appears as a childish game in her films would thus be a stand-in for a deeper political struggle. But, in the end, the simplicity of her stories grants the universality of their message. Maybe those stories are only for little kids and have nothing deeper than opposing good, and bad in every day playful situations. But the value of the films is exactly the honesty of this proposition. The films are so simple and beautiful, that today, one almost feels alienated by their naivety. When have you last thought seriously about the idea that it is really bad, and utterly mean to exclude others? Týrlová’s films are able to survive without any cheap tricks. They don’t invest in anxious efforts to keep the seven-and-above audience from falling asleep with meta-narrative irony, or vulgar jokes the seven-and-under audience wouldn’t get. Týrlová doesn’t seem to care about the wittiness of her audience. She aims at their hearts. She is crazy enough to think that children can simply find pleasure in recognizing the different animals and saying their names aloud. Which is true.